Developers continue to have a field day in Glen Eira. Council can spruik its planning prowess all it likes, but its performance has been abysmal in protecting suburbs, residential amenity and heritage. Elsternwick is Glen Eira’s current sacrificial lamb, following on from Carnegie. 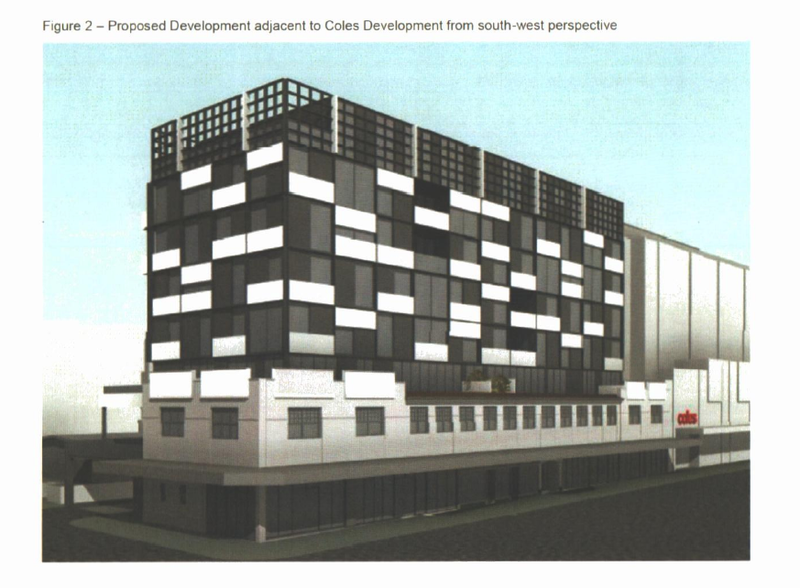 We now have another application alongside the Coles development for an 8 storey, shops, offices and 23 apartments – the majority being 2 bedroom with 8 being three bedroom apartments. Of greater significance is that the site is located in a heritage overlay and the existing buildings are deemed as ‘contributory’ in the planning scheme. Furthermore, according to the current structure plan, there is a preferred height limit of 4 storeys. But of course, since the height limits are only ‘preferred’ there is nothing to stop any developer applying for 8 or 10 or even more! We have to wonder how hard Council fought for mandatory controls in Elsternwick overall, and specifically in these heritage overlay areas. If Bentleigh & Carnegie achieved mandatory heights, then the question needs to be asked as to why Elsternwick is the odd man out. Plus why wasn’t Elsternwick included in the first set of structure planning undertaken by council? Perhaps this expert should explain what ‘modest level of heritage value’ means – especially since the buildings are designated as ‘contributory’. Surely, either something is of heritage value or it isn’t! But it’s not only these dwellings. This ‘expert’ sees the entire heritage overlay as being of ‘modest’ value. Of course, there is nothing stated to ‘quantify’ or even justify such perverse adjudication! taller buildings of up to 8 storeys being constructed in the shopping strip. being significantly eroded by, or lost to, major development. Thus the existence of heritage overlays which supposedly curtail development became the argument for 12 storeys along Nepean Highway. Since Glen Huntly Road is now a developers’ paradise, one could very well question why we still need 12 storeys along Nepean Highway? Or an even better question – given current high rise activity along Glen Huntly Road, and if the heritage shopping strip is so ‘truly unique’, then why has the major Heritage Review been put off until years down the track? If heritage is truly a priority then nothing can excuse this inaction. But then again, we remind readers of councillors’ dismal record on heritage when they recently voted to grant a permit for a 12 storey building in the Derby Road heritage area. We anticipate more of the same here with the argument being that there already are plenty of high rises along Glen Huntly road and its surrounds, so one more won’t matter! This of course makes an utter mockery of their structure planning! The only ‘certainty’ has been provided to developers. The message is clear – go for it and the higher the better! Heritage updates won’t start until 2022-2023. Plenty of time for heritage to be destroyed. Part of the grand plan maybe. This is the starting time only. Add at least another 2 years on top of this which will make it 2025/26 by the time it’s finished. It only took council 14 years to get its 2003 review doc into the planning scheme. This time round should be 7 years. That’s progress in snail pace Glen Eira. Pro-development agenda and incompetence prevail.